We’re a couple of months into Project HQ GTS and so far, to the casual observer, what we seem to have done is turn a once-successful Touring Car Masters HQ GTS into a surprisingly small pile of parts, plus a hollowed-out shell. It’s about now you start to realise just how much work is ahead. 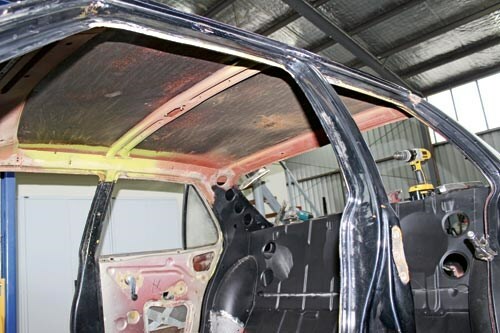 Not only have we gone back to the shell, but in some areas the good folk at Bendigo Retro Muscle Cars have turned a double skin into a single to winkle out any potential rust areas. Even Uncle Phil is surprised. "We were up here about a month ago," he explains. "Gary said he would get into it – he got into it alright!" Gary O’Brien, TCM race driver and owner of this and Bendigo Accident Repair Centre, is the man running the project. He, like Phil, is actually surprised by how good the body is. "It was a really a rust-free body – why would anyone turn it into a race car in the first place? It’s done its tour of duty and now it’s on the road to recovery." Despite what you see in the photos, Phil agrees: "I can’t believe the integrity of the car. 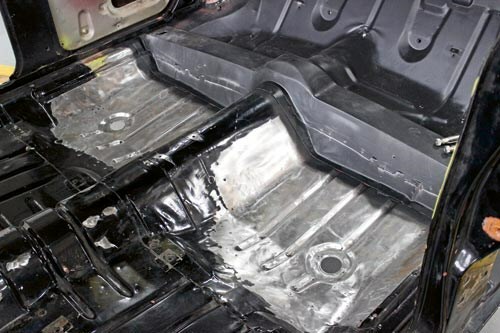 For example, the plenum is known to rust on these, but this one is perfect." What we’re seeing is a reflection of Gary’s ultra-methodical approach to this style of restoration. He figures it simply isn’t worth doing unless you’re thorough. "When you’ve got a few footy seasons on, you’ve seen these cars, restored them, seen what happens to them over time," he says. "We’ve established over the years a repair method that really is the only way to go. You need to do it properly. You pull everything off and put it back on, it costs a lot, but that car will be right forever. "There’s nothing worse than getting a car repainted and three years later there are bubbles of rust coming out where you know they’re going to. We’re trying to prevent that." 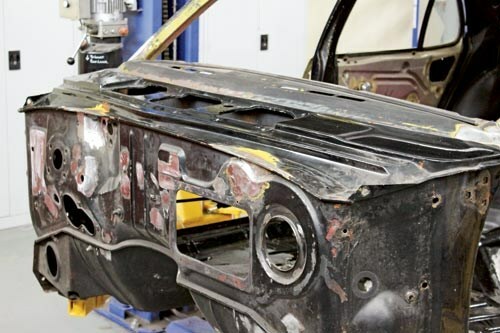 When it comes to individual areas of the car, the repairs needed are caused by a mix of its individual history, plus its design and construction from the factory. When it comes to the history of this particular car, you need look no further than the bright and shiny weld patches in the boot. There are three of them. "When it was a race car, to get to the fuel cell we had to cut a hole in the boot floor, so we’ve welded that up," says Gary. "It had a towbar originally, but we’re getting rid of all that, because a muscle car shouldn’t have a towbar. It looks wrong. "The old girl has had a few hits," he adds. 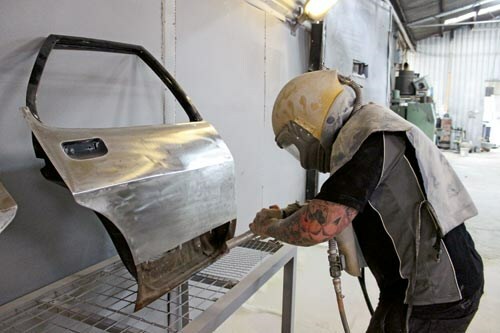 "We’ve got a few refurb panels and the reason for that is inherently with these cars there will be little rust pockets. We want to eliminate all that. We fully expose them and then we spot weld them back on as per the factory." The list of ex-factory problems goes on, though GM-H was on par with the industry standard for the time. "Nearly every model has a problem area," says Gary, "just from the design, such as around the wheel arches and the dogleg and the rear window. "We’ve exposed around the wheel arches, because there’s a lot of seals in there and they trap moisture. All of a sudden they turn to you-know-what. 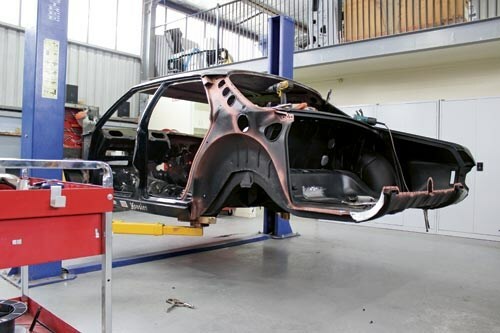 "Because it had been belted around a bit, we wanted to expose all that, fix the rust, do the repairs properly and spot weld it back together." The doors have also become a major focus. Chances are that GM-H didn’t imagine someone might be treasuring this car some forty-plus years after it rolled out of the factory. 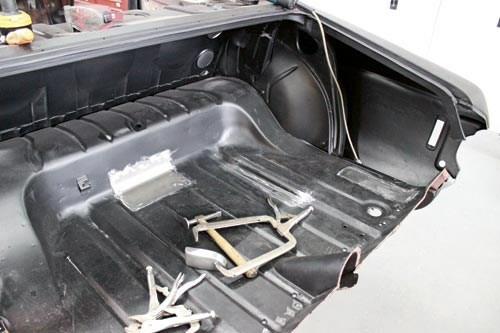 Construction of the doors is simple and, while they have some tar inside for sound-deadening, there’s little paint and not much in the way of rust prevention. That construction, the fact the window seals had a tendency to give up the ghost and the drain channel had a habit of blocking, means you have four giant rust traps. Gary’s cure is to cut the skins, get inside and deal with the rust, then fit corner patches before sealing it all up with a new skin. That means the car will outlive its next owner. The crew also plans to go through every section of the chassis like a dose of salts. With heaven-knows how many miles under its belt, some of them going door handle to door handle around a race track, any car is going to get weary. Gary explains, "What happens to these old girls is that, typically, in your areas like suspension, they get that much fatigue from all the flexing. We know how to tighten all that up and this thing will be just like a brand new HQ." When he says ‘just like’, he’s being a little modest. You see, last time we checked, a plan was being hatched to give it a serious power boost, along with some key upgrades to ensure it handles, probably better than any brand new HQ ever did. Pretty cool huh? In any case, Gary is rightfully confident his crew can tackle whatever is thrown at them. After all, they’ve seen it all over the years. "The guys that work with us are at the top of their game and we’re all like-minded. These projects don’t scare the boys, they’re well and truly up for it," he says. Now we’ve seen the true extent of the project, you can’t help but wonder just how many hours are involved. Gary thinks for a minute and offers, "I reckon by the time it’s on its wheels it’s going to be up around 800 hours." Clearly, this is not a job for the impatient or faint-hearted. Rare Spares: Looking to restore, repair or rebuild a HQ? Contact your nearest Rare Spares store for parts, advice and service.